A while back I posted my thoughts on TXDoT's proposed plan to redevelop I45N. Oscar Slotboom, author of Houston Freeways, shared similar concerns and recently met with TXDoT to discuss them. I've included his summary of his key findings below from his HAIF post here, or you can find a more comprehensive issue-by-issue list and TXDoT response here. It's important to note that nothing is final at this time, and all of this is subject to change as TXDoT goes through the process, but this is the preliminary feedback he received. The headliner for most people is that they're intent on selling the land under the Pierce Elevated to fund other right-of-way purchases, so that disappointingly kills the idea of a Pierce Elevated Park (concepts here and here). I'm also disappointed they're declining to connect Midtown and Memorial to the new downtown connector (or 59, in Midtown's case), which I think is a big mistake (although they are adding one for Allen Parkway, thank goodness). They're also still not considering connecting up the managed lanes through downtown to create a more comprehensive network - instead they just terminate downtown the same as they always have. The only benefit left I'm really excited about is fixing the inbound 59S bottleneck at Spur 527 and the elevated, and that could be done without doing the whole project. On Monday I met with a TxDOT representatives and representatives from HNTB, the consulting firm developing the design for the project. We reviewed my points of concern, and I updated my web page with the status of these issues. Although most of my concerns cannot or will not be addressed to the extent I would like to see, I appreciate that TxDOT took a close look at the issues and I think the ultimate design will be the best it can be within the financial limits, political constraints and traffic model results. Note that nothing below is final or officially decided for the next version of the plan until TxDOT officially releases it. There will not be connections from Memorial to the downtown connector. 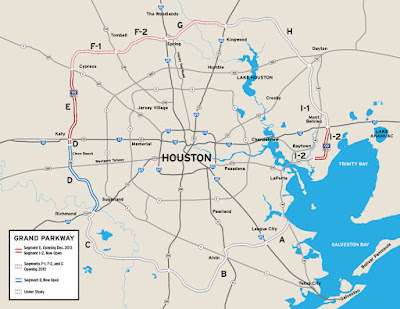 Both the City of Houston and TxDOT are against connections. The COH and Downtown Management District are going to provide a recommendation for adjustments to the surface street design around Houston Avenue. The George Brown Convention center uses the area under the US 59 elevated as a staging area, and the need to retain a staging area is expected to require changes to the proposed design and will likely preclude widening the trench for additional I-45 lanes. The current proposed plan reduces Interstate 45 to two lanes in each direction through downtown. It appears TxDOT will try to add lanes, but due to GRB issue, it is uncertain to me how much relief can actually be provided. The proposed design has a built-in bottleneck at I-45 and North Main (Hollywood Cemetery area) due to the right-of-way issue. They are studying ways to get more lanes through, but I'm not optimistic that the choke point can be fixed. TxDOT's preference is to sell the Pierce Elevated land and use the revenue to purchase property needed for the project. Before selling on the open market, TxDOT is first obligated to offer the land to the COH, and then to adjacent land owners. It is unclear what price the COH would have to pay if it wanted the land. But I sensed no indication that the COH is interested in the land. If the COH has any money, it would likely go to a deck park over the trench near the GRB (my opinion, not a TxDOT remark). I expect a full deck park to cost in the $200-300 million range (my number, not TxDOT's). Poor connections to the I-45 managed lanes in the downtown area are likely to be fixed in the next plan iteration. TxDOT agrees that I-45 would perform better with five regular lanes in each direction between Loop 610 and BW8, and this is under study. I'm hopeful we'll get longer sections with five lanes, hopefully the full length from Loop 610 to BW 8. TxDOT's goal is to have signature bridges wherever feasible and is looking to work with neighborhoods and districts to realize local preferences. But signature bridges will cost more and funding could be an issue. See the web link for the status of all issues. "While the average annual income in Texas is $45,330, only slightly above the national average, MoneyRates.com says "workers in Texas get good value from those wages." That's due to our below-average cost of living and no state income tax." "Adding all of this early data up, these three new rail lines are attracting only between 10 – 35 percent of their predicted ridership estimates. All of this for some $2.2 billion in local and federal tax money. If you apply the U.S. FTA formulas for grant consideration to current ridership on these three rail lines (total capital cost $2.2 billion, multiplied by 7 percent ($154 million), then add the annual operating expense of these rail lines at roughly $1 million per direction mile for $25 – 30 million in annual operating costs), it would work out to costing somewhere close to $50 every time a new rider boarded along these new rail lines." Houston ranked the #1 food city in America by Travel + Leisure, and I believe it! Was browsing my Yelp bookmarks the other day to recommend a place for some out-of-town visitors, and went through 150+ places I've bookmarked just within a couple of miles of Midtown! If you're curious why Houston has such an amazing restaurant scene vs. other cities, I lay out the reasons here. A lot of people shudder when they see growth projections of the Houston metro area from the current 6.5 million to 9 or even 10 million people over the next couple of decades. If traffic is this bad now, how can we possibly handle it? Is there any way this can be handled gracefully, or at least less painfully? I think it can be if we look at it with the right perspective, and I call that perspective "Snow White and the Nine Dwarves" (yes, even the fairy tales are bigger in Texas - I considered "Asgard and the Nine Realms" of Norse mythology, but I think that's too obscure a reference for most people). If you look at a lot of modest-sized cities, they can operate effectively on as little as two crossing interstates/freeways. 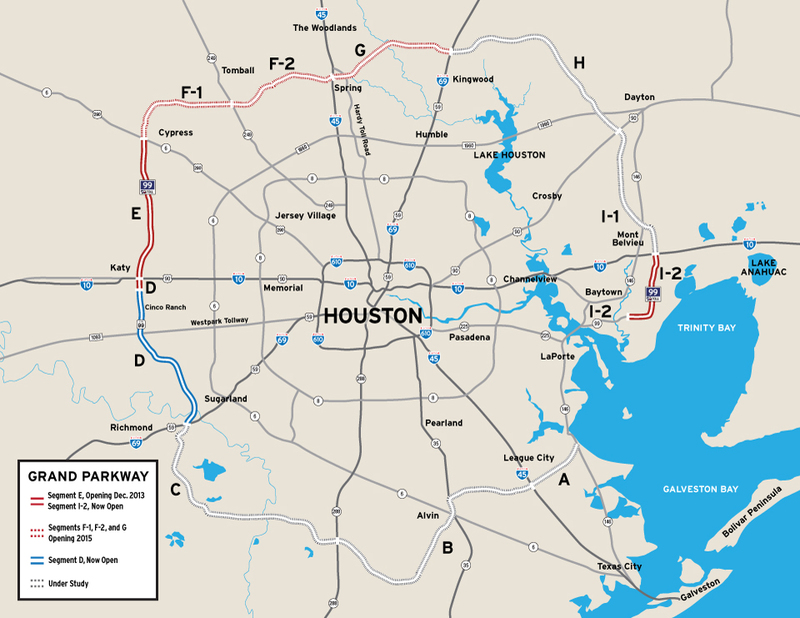 As you can see in this map, Houston's rapidly growing Grand Parkway outer loop is creating many more of these crossings along our radial spoke freeways. I think each of these "villages" could comfortably grow to as much as a million people themselves, which, when added to 2-3 million in Houston, gets us as high as 12 million people in the metro area, almost doubling our current population and handling several decades of growth. Under this scenario, I would see much of the job growth increasing along Beltway 8, with workers with families commuting in from the villages and young inner loop singles commuting out, with both able to keep commutes under the magic half-hour limit (hopefully). This is somewhat similar to how DFW has grown over the last decades, although almost all of their villages/edge cities went straight north and northwest, which has shifted the metro's center-of-gravity towards the airport and has not been very healthy for the City of Dallas itself. If Houston can encourage somewhat balanced growth among the nine dwarves, it will help the core stay healthy as well, since employers will want to stay there to be able to draw employees from the entire metro (not to mention the young inner loopers) rather than commit to moving out to a single village like Exxon. Not arguing against good, cost-effective transit - it is absolutely very important - just saying you have to take support surveys with a grain of salt and make intelligent, pragmatic decisions about road vs. transit investments based on real-world usage. "I ask Glassman a few times in a few different ways, What makes Houston Houston? There's a "misfit tinkerer" mystique to the place, he finally answers. "Think of the Astrodome," he says. "The Art Car Parade. Wes Anderson. The Orange Show. The Beer Can House ... "
Devastating factoid on commuter rail as constructed in Orlando. Can you say "massive white elephant taxpayer boondoggle"? "We’ve all heard the claim that a rail line can move as many people as an eight- (or sometimes ten-) lane freeway. Not so much. Orlando’s billion-dollar commuter-rail line carries less than 2,000 people to work each weekday morning and home in the evenings. (Amortized over 30 years at 3 percent, it would have cost less to buy every single daily round-trip rider a new Prius every year for the next 30 years.)" I generally like to avoid politics on the blog, but found this a compelling argument that the Republicans should adopt an urban policy of openness and affordability (second item). Hear, hear! Would love to see the Democrats adopt it as well! "As a result of decades of Democratic governance and misplaced priorities…American cities do not offer the opportunities for success and growth that they should, especially for those looking to climb the socio-economic ladder. In many cases, city governments are utterly dysfunctional. And the reason for this dysfunction is that our cities are too often closed—closed to businesses and closed to outsiders. For the middle class and those striving to make it up the ladder, the taxes, housing, and other costs leave cities simply too expensive to afford—especially with a family. Excessive regulation makes it difficult, if not downright impossible, to get the permits necessary to start a business. Cronyism and a lack of transparency make it difficult to know whether anyone is trying to fix the situation." "Housing regulations have been used by the urban left to restrict new construction, as if city neighborhoods are gated country clubs that should never allow change or new people. The liberal business elite have fortified the business permitting process so much that, in many cities, it is nearly-impossible for competing entrepreneurs to enter basic professions like hair-styling. And to carve out a voting bloc, the left has defended unionized public monopolies that deliver services at far higher cost, and less efficiency, than is necessary. To the authors, making cities more “open” would mean embracing economic and administrative liberalization. They call for housing deregulation, so that cities can accommodate growing populations; one-stop shops for business permitting; and civil service reform, so that bureaucracies are either held to better standards, or replaced through privatization. They also call for better online data, so that residents can easily view info on their cities’ spending and debt, and gain access to officials." Finally I want to end with an excerpt from Gov. Perry's National Press Club Speech highlighted in the Wall Street Journal. Hat tip to Wendell. "There's a lot of talk in Washington about inequality, income inequality. But there is a lot less talk about the inequality that arises from the high cost of everyday life. In blue state coastal cities you have these strict zoning laws, environmental regulations that have prevented buildings from expanding the housing supply. And that may be great for the venture capitalist who wants to keep a nice view of San Francisco Bay. But it’s not so great for the single mother working two jobs in order to pay rent and still put food on the table for her kids. It's not just about how many dollars you earn, though there are still pretty substantial opportunities for that in the State of Texas. It's also about how far each dollar that you do earn can take you. After you’ve paid your taxes, you’ve paid your rent, your tuition, your grocery bills. "